Unless your tractor/magento has been converted to an external coil, the wire from the ignition switch to the magneto should not have any voltage. The wire is there to ground the magneto through the switch when you are ready to stop the engine. The wiring diagram is in the owners manual which you can download from the "QUICK LINKS" tab at the top left corner of this page. Good Luck. Maybe you do not have any major damage. That is not a regulator, that is a cutout. 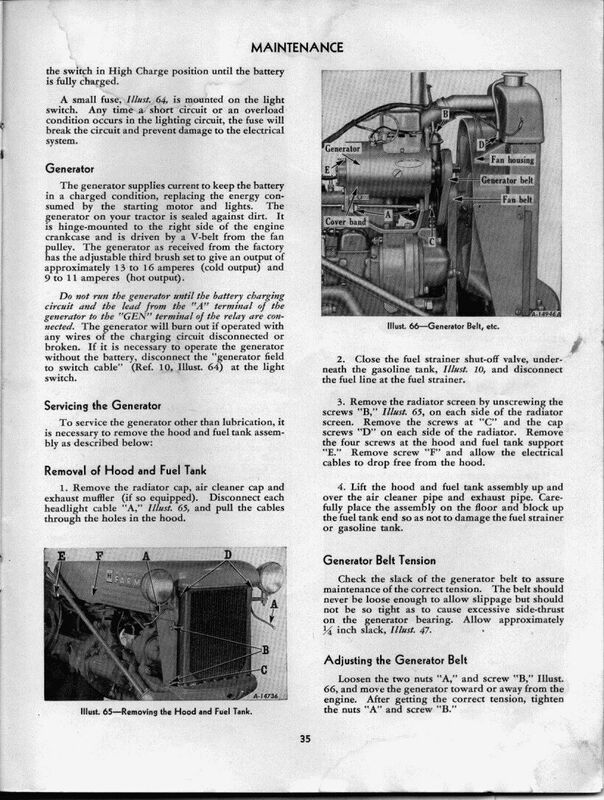 I was going to post a link to the proper diagram for it on Farmall Bob's site, but Photobucket will no longer allow me to even look at it. Wiring diagram for the cutout should be in the 48, or so, owners manual. Is this the wiring diagram he should be using? ParlowMillFarm wrote: Is this the wiring diagram he should be using? yes, that is the correct diagram for a cutout with magneto, so long as magneto has not been converted to use a separate coil. Yes, the F terminal on a cutout is used on stationary engines to provide a partial ground and keep the battery charged. The wire from the F terminal to the light switch allows you to controll the charge using the Hi and LO setting on the light switch. An alternative is to replace the cutout with a regulator and leave the F lead where you have it, which will allow the regulator to control the charge rate. John *.?-!. * cub owner wrote: Yes, the F terminal on a cutout is used on stationary engines . . .
And tractors with a starter but no lights. I'm not sure from what you wrote if you have the 4 position switch, it originally had High and Low charge, and Dim and Bright lights. You had to pick the charging rate that the battery needed. The charge rate, and the lights were in the same switch. 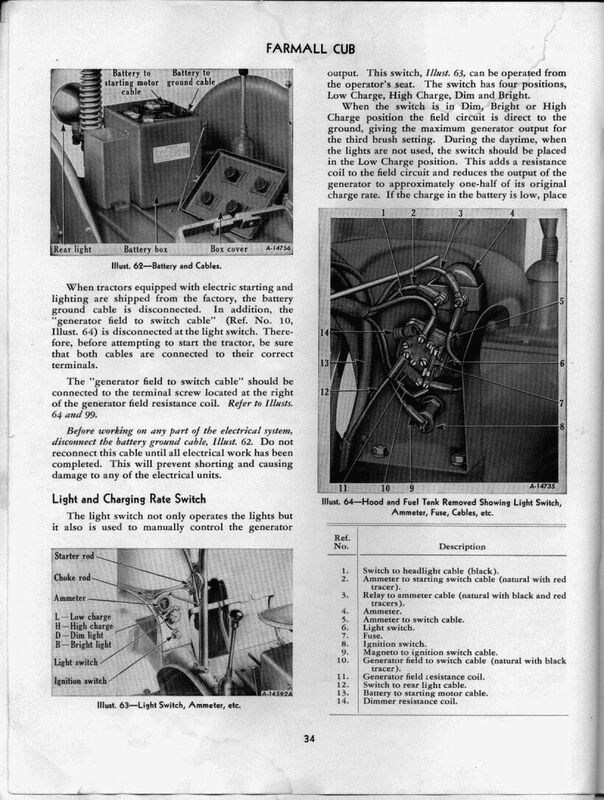 Below is a page from the Cub owner's manual showing how they originally looked under the hood, and 2 pages telling about the switch. 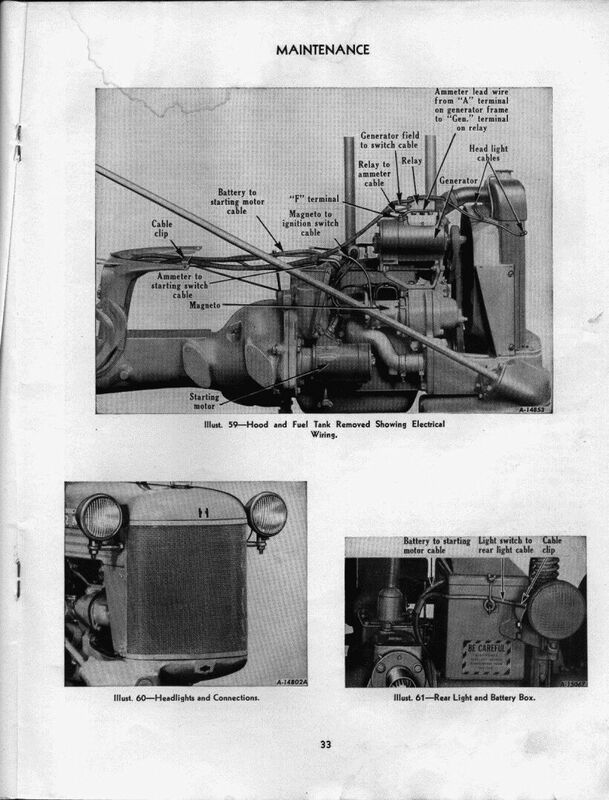 IH called the cutout a Relay. If you need a 4 position switch, you might have to find a used one, not sure, someone might have them new. IH started using a 4 position switch on the Cubs in about 1958 that was just for the lights, it is not the same as the 1940's switch. This is the rear of the 4 position switch, pic from TM Tractor. White smoke at exhaust. Fuel or oil additive?